A while back I researched and purchased a set of Winter tires for my Model S (S85, not AWD). I bought the Nokian Hakkapeliitta R2 tires and I wanted to provide an update on driving in wet, snow and icy conditions in the Model S with these tires. We’ve had some record breaking snow here in the Northeast US and all sorts of mixed conditions to drive in. 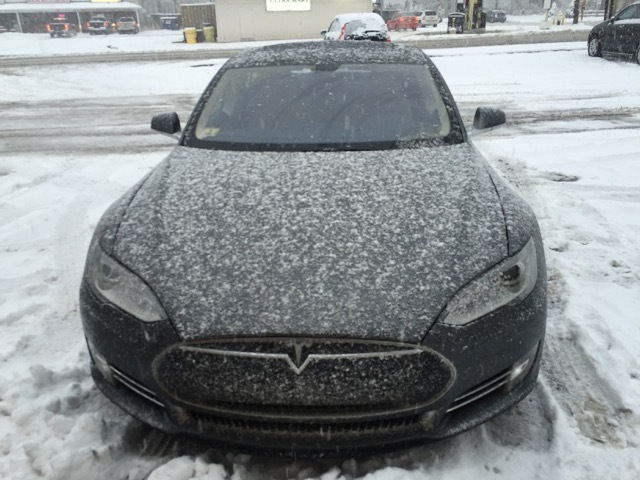 Auburn, MA, location of one of the two superchargers in Massachusetts got 36″ of snow. Before I can really address the winter tire performance I need take a detour and discuss traction control. Like almost every car on the roads today the Model S has both stability and traction control to help you maintain control of your car. If you try really hard you can see this kick in in wet weather but it really comes into play when you have a wintery mix on the road. I previously covered how the traction control system works in the Model S, but it really comes into its own in the Winter. The Model S is able to respond to wheel slippage much faster than other cars due to the super-fast response time between the traction control system and the motor driving the wheels. The Model S very quickly shifts power between wheels as one slips via the open differential and it backs off power if things continue to slip. This means if the traction control is enabled its really hard to get the tires to slip. With traction control you can literally pull onto a patch (or whole road!) of snow and floor the “go pedal”and the Model S will begin picking up speed as long as the wheels aren’t slipping. Its a fun and bizarre experience to do this and so far it hasn’t gotten old. Stability control does a similar thing for your steering using brakes and power to get things back under your control. 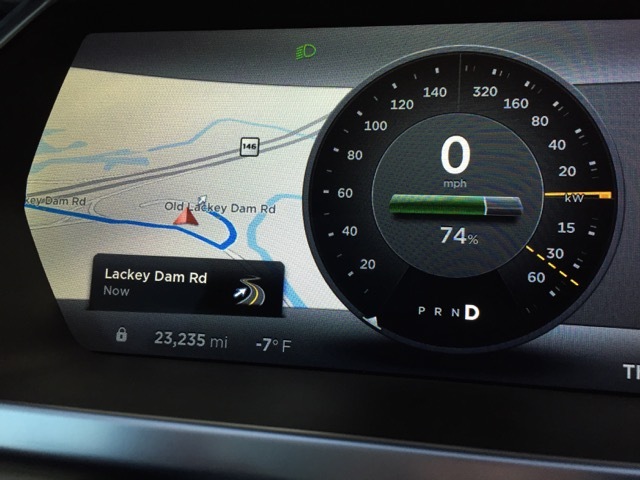 Because the Model S is making sure your tires remain in control and is managing the power (and essentially speed) for you the net effect is you have a lot more control over the car. With so much much intelligence and reaction speed helping you to keep control over your car you may be wondering where tires factor in. For brakes to work the tires have to grip. For your car to move forward the tires have to grab hold of the surface they’re on. All the intelligence and control in the world won’t help you if you’ve got tires that don’t grab the surface you’re on. Knowledgeable people will tell you the tires are more important than all-wheel drive vs. rear wheel drive. At the extreme case in the Model S when you have tires that aren’t up to the task when you try to move you’ll go nowhere. The tires won’t slip and the car will remain in control, but you just won’t move. Last year here in Boston there were reports of Model S owners that couldn’t drive up the small hills in the city. This all comes down to tires. Those 21″ tires won’t get you up the hills in Boston winters. 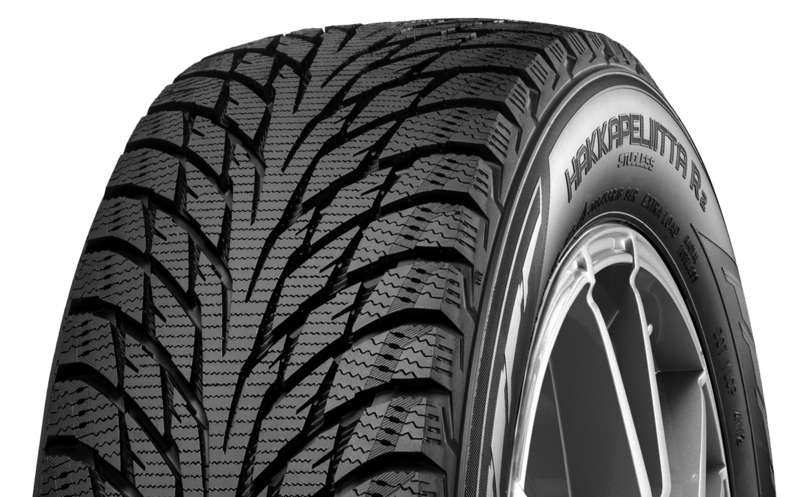 The Nokian tires are designed for the winter. They’re designed to grip on snow and ice and at low temperatures. I tried the tires in a number of different conditions ranging from a few inches of snow, to a foot of slush to ice/snow mixes, to extremely cold weather and in each case the tires were able to grab hold. It can be a bit concerning when you’re trying to go faster and the car is slowly moving forward but the key is you still move forward and the tires still grip. If your car is warm enough and regenerative braking isn’t limited you may want to put it on low. The aggressive deceleration of full regenerative braking isn’t a good mix with slippery conditions. The Model S is low to the ground, you can’t use your Model S to plow through the snow. I’d think twice before driving through more than about 6″ of snow regardless of your setup. Be extra careful around turns and give yourself lots of extra stopping distance and leave a good gap between you and the car in front when you stop. Stay home and work at home if you can. The Model S is really efficient, but not commuting at all is even more efficient. You can still go sit in your Model S if you miss it! There are all sorts of guides and advice out there on safe winter driving that are worth reading to make sure you’re ready. Great post! But re: snow height: depends on your suspension. If you have air suspension, as I do, I believe you can go through about a foot of snow when the suspension is set to Very High. Maybe more than a foot. I’ve gone through some snow that would’ve stopped me in other cars… and even stopped me at Standard height. I would crank up to High or Very High and be able to keep going. Thanks! Great to know. I don’t have the air suspension so I get what I get. But so far I haven’t had to push it thank goodness. A point of caution re: snow depth is that the bottom of the Tesla is a flat surface, like a toboggan, and if you have some speed on and hit a drift you could slide up on top and come to a stop with all the wheels out of contact with the ground. A winch or tow truck would be the only way to get down.